And in depth autoplay feature is also available that allows to you to set the layouts, bet amount and number of spins so you can just sit back and enjoy the action. This game uses the Microgaming software company who are known for some of the better looking and functioning online casino games in the world. You can play Premier Roulette at Video Slots (Not available to Americans, but check out Roulette 5 at WinADay Casino instead.). Videoslots is an entirely Instant play casino meaning you play at this casino through your browser using a flash player and it will work on any and all internet browsers. Once registered at VideoSlots it’s very easy to navigate around this Casino. All of their games are broken down into categories along the left side of the main screen at VideoSlots and there you will see Roulette. Once in there all of the 9 roulette games playable here are listed so choose Premier Roulette and good luck. There are lots of great added features for Premier Roulette which separates it from other versions of roulette at VideoSlots and around the web. – So many added options in here from special bets to the autoplay layouts. Select you wager amount which are represented by chip denominations along the bottom of the screen. To place a bet, click directly on the number or group of numbers you would like to bet on. To use Turbo Mode you need to change the game speed to Turbo from the game speed tab to the left of the Wheel. Blow that game speed is the change Table option. Under the Expert button located at the bottom right of the screen is where you will be able to customize the layouts and autoplay features. Once you click Expert you will open up the Expert screen which shows you a different view of the betting table. Select your bets and to save it as one of the 5 available saves, click one of the numbers and click save then move onto the next until you have saved a different pattern for each number. Once finished click the Back to the table option and to begin the Autoplay feature choose one of your betting layouts then open up the Autoplay option. From there you can elect some amazing options to virtually have the game play for you for hours. Overall a very solid version of Roulette but what really stand out to me is the very deep Autoplay options. It’s nice to sit back and watch your account climb as you sip on your beer. But another cool feature is the ability to change the colour of the table. This is a great feature for the superstitious player. I would recommend this game to all players but it may be a little overwhelming to new players with all of the added features. And for new players there are plenty of easier to understand games here at VideoSlots. But if the chance to have the game run through your pre-saved betting patterns for 500 spins is appealing then be sure to give this a try at Video Slots (Not available to Americans, but check out Roulette 5 at WinADay Casino instead.). Good Luck my Friends. Roulette is a fairly simple game to learn, and Premier Roulette is no different. There is a table and a spinning wheel. All you have to do is which section the ball in the wheel will land up on, and you make your choice by placing bets on the table. This dynamic game can have a number of players at any given time, and you will be guaranteed to experience an immense thrill when that ball starts spinning. If the ball lands on the figure or color on which you placed your bets on the table, You Win The Corresponding Amount Of Money! When it comes to online gambling, your choices are many and varied. And with the advent of 3D technologies, there really is no reason why you should not expect a high quality experience when gambling online. Premier Roulette has been designed with the demand for this experience in mind. It delivers on all fronts, and you will see just why! There are many reasons in fact, why you do not need to make long visits to an actual casino, getting the same thrill with the click of your mouse! Firstly, the organization of the buttons on this game has been remarkably improved upon, and this, coupled with a number of added features makes this game unique and exciting. If you thought that roulette was a casino standard that was difficult to improve upon, Premier Roulette definitely proves this to be a myth. You can also place a variety of bets, from outside in, inside out, call bets or split bets. The roulette wheel is displayed in quality 3D format, allowing you to place a combination of bets in any order that you want to. Just how does this roulette game compare to the others available online today? What Is Unique About Premier Roulette? Visually, this game offers you a variety of choices. You will be able to select the appearance of you table felt, and choosing different color wheels. You can also change the tables as you need to, and review your game stats with the simple pressing of a button. The high quality graphics used in developing this game truly provide game players with an exceptional gaming experience. How To Play Premier Roulette? With free versions of this game available, you can comfortably try out the new version without the risk of losing money. As you get comfortable with the ins and out of Premier Roulette, you can move on to the paid versions of this game. But just how exactly do you play this particular form of roulette? · Check out the maximum and minimum bets on each table firstly, choosing the table with the minimum number of bets reduces complexity and greatly increases your chances of winning. · Before the ball starts spinning, place your bets on the chips for the numbers you select. It really is that simple. You just need to be familiar with the rules of roulette, and use them to develop your own strategy to help you win great fortune. There are a number of betting options that can choose from, and you can use them in a number of combinations. Some of these bets are explained below. · Inside Out-These are those placed on the main number grid on the roulette table. 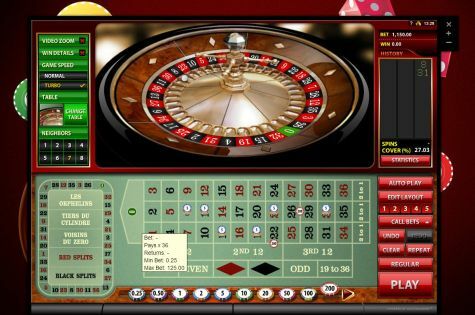 · Outside In-Generally considered the safer options, these cover certain groups of numbers, and they are called ‘outside’ because they cover boxes that are outside the main number grid on the roulette table. · Split Bets-These bets cover any two adjacent numbers on the betting board. · Call Bets-These bets mainly have French names because of their availability in mostly European and French roulette. They are available online however, on Premier Roulette. Examples are Voisins du Zero, which covers the 17 numbers closest to zero on the wheel, and Jeu Zero, which covers the zero, the four numbers to the left of the zero, and the two numbers to the right of the zero on the wheel. · Street Bets-This is any one of the 12 rows of three numbers, such as 1,2,3;4,5,6;and 7,8,9. Roulette is a fairly easy game to learn, and it is a popular game of chance for a reason. Once you become familiar with the rules of this game, and its various betting structures, you will be well on your way to success. Premier Roulette offers you a great opportunity to beat the odds, and beat the house, albeit online!